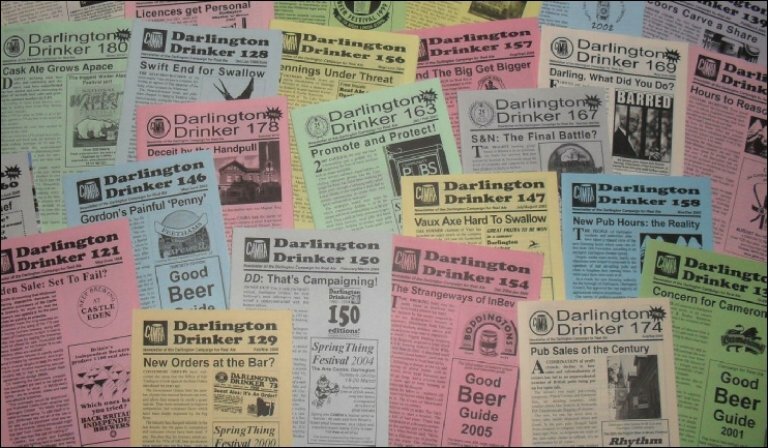 Darlington Drinker is the newsletter of Darlington CAMRA. Approximately 4000 copies are distributed to real ale outlets within our branch area and along with adverts for these outlets, there are regular contributions by our branch members. Brendan Boyle has been responsible for editing Darlington Drinker since the branch was formed in 1982, but took a sabbatical at one stage and former branch member Steve Last took over the reins for a while. After producing Issue 180 of the newsletter, Brendan stepped down as editor after many years in the job. The branch and many CAMRA members would like to thank Brendan for his effort and commitment over the years in producing such an informative newsletter with many excellent articles and features, some of which can be seen on the covers of the issues in the picture below. Veronica Burningham took over the editing of Darlington Drinker and produced Issues 181 to Issue 185 and decided to step down as editor after producing Issue 185. Again, the branch would like to thank Veronica for her effort and commitment in producing these issues. Ian Jackson took over as editor from Issue 186. Please note Darlington CAMRA reserves the right to amend or even refuse to publish any articles submitted.